If you hear ‘Saint Nicholas’ you immediately think of Christmas, a red bag full of presents and your mind wanders into the sweet memories of childhood. Yet there are many people who never heard of bishop Nicholas of Myra who lived during 4th century AD in a faraway place known as Asia Minor (modern Turkey). How did Saint Nicholas became a modern day Santa Claus? With over 17 centuries of venerating this popular saint, his life became a folklore fairy tale – told, repeated and often enhanced in many languages. It is hard now to separate myths and legends from facts but let’s see who is Santa Claus and what we really know to be the true Saint Nicholas facts. Saint Nicholas was born in Patara at the end of 3rd century. Patara was a flourishing commercial port on the Mediterranean sea mentioned in the New Testament as the place where Paul and Luke changed ships: “And when we had parted from them and set sail, we came by a straight course to Cos, and the next day to Rhodes, and from there to Patara.” (Acts.21.1). The city was buried under the sand for centuries and is still undergoing excavation. Archeological expeditions have recently revealed ancient Greek temples, streets lined with columns, a theater, and a Roman milestone, announcing the official roads built under governor Quintus Veranius with distances to major cities of Roman Empire. In his early childhood Nicholas became an orphan when his wealthy parents Epiphanius and Johanna died during a devastating epidemic, and was raised by his uncle, also named Nicholas who served as a bishop of Patara at that time. The boy was a very devoted Christian from an early age, rigorous in his studies and faithfully observed the Wednesday and Friday fasts, eating only once on these days. He was later tonsured as a reader and then as a priest by his uncle. Other sources indicate that Saint Nicholas was not an ordained priest when the citizens of Myra decided that they want him as their bishop – a rare occurrence that proves his popularity among people and respect to all the charitable works that he did in the region, most of them in secret. When his parents died, they left Saint Nicholas a sizable inheritance. Instead of indulging himself as many young men would do, he concentrated on giving most of it away to people who were in need. One of the most known stories about Saint Nicholas is the story of him helping a poor man and his three daughters. 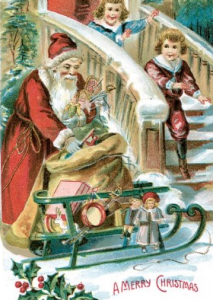 The impoverished man was too poor to provide a dowry to marry his oldest daughter, so when Saint Nicholas learned about poor man’s hardships he decided to leave him a bag of gold that he threw through an open window during the night. When poor man discovered the bag of gold, he was relieved and delighted – now his daughter could marry! According to other sources, Saint Nicholas threw the bag through the chimney at night, climbing on the roof so he couldn’t be seen, and the bag landed in one of the stockings hanging by the fire. Do you see parallels with modern traditions associated with Santa Claus? Saint Nicholas’s charity didn’t end with the poor man’s oldest daughter – he provided the middle one with a bag of gold too when it was time for her to marry. When the future marriage of the youngest girl was announced, her curious father decided to hide and see who was the anonymous saver of his family. His night watch paid off – he was able to thank Saint Nicholas, overwhelming him with his gratitude. The story of Saint Nicholas’s charity spread through the whole region and later, after his death, was told and retold all over the world, setting a tradition of gift giving in December. The day when Catholics and some Orthodox Christian celebrate the life of Saint Nicholas falls on December 6 (December 19 according to the old calendar of the Orthodox tradition); this became the day of small gift giving. In Germany children leave one shoe outside with some hay (for Saint Nicholas’s horse) and later find chocolate gold coins in their shoes. The theatrical procession with Saint Nicholas on a white horse accompanied by people in costumes is a popular tradition in villages of Bavaria. One of a known facts about Saint Nicholas is that he attended the first ecumenical council held by the church in 325 AD. The 1st Council of Nicea was known primarily for its formulation of the Nicene Creed. Though some historians doubt that he was among the attendees, the name of Saint Nicholas, bishop if Myra, is mentioned in some of the lists, mainly the most important Greek one, but not on all of them. The council members were dealing with the wide-spread Arian heresy proclaiming that Jesus Christ was created by God the Father and thus is inferior to Him. It was reported that during a heated discussion Saint Nicholas hit Arius in the face, in front of everybody. It was so shocking to the emperor and all the bishops attending the Council of Nicea, that Saint Nicholas was stripped of all his bishop’s insignia and thrown into prison. At night the Mother of God appeared to several members of the Council, convincing them to restore Saint Nicholas as a bishop. Another popular story of a miracle performed by Saint Nicholas is the story of wheat multiplication. The city of Myra was experiencing a severe famine and Bishop Nicholas approached one of the ships in the port asking the sailors to share some of their wheat with starving people. The sailors were hesitant to obey, as the wheat was destined to arrive at the court of the emperor in Constantinople to be weighed precisely and they would be severely punished if some of the cargo was missing. Saint Nicholas convinced them that the weight of the ship would not change and the surprised sailors found it to be true, though the wheat that they left in Myra was enough to feed the all the people, with some left over for sowing. 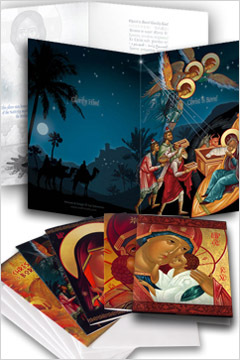 So, our Christmas traditions of helping the poor, feeding the hungry, and affirming our faith have a long history. Saint Nicholas is the most venerated saint, after Mother of God, throughout the world. There are numerous churches built in his name and a long tradition of iconographic images, from the south of Italy to the northern monastery of Kizhi in Russia. He is the patron saint of merchants and sailors and is sometimes depicted standing on a boat or saving a drowning sailor. Saint Nicholas is also the patron saint of Greece and veneration of the saint is called “Nikolobárbara” there as it is associated with the preceding feast of Saint Barbara (December 4th). The holy relics of Saint Nicholas are currently in the crypt of the Basilica of St. Nicholas in the city of Bari, on the Adriatic shore. Though the saint was buried in Myra, the Italian sailors moved his relics to preserve them from the Muslim conquest of Asia Minor after Romanus IV, emperor of the Byzantine Empire, lost the Battle of Manzikert in 1071 and was captured by Turks. In 1087 on a long journey through Greece, Palestine and other ports, 62 sailors from Bari, pretending to be merchants, finally arrived at their destination and collected most of the relics from the white marble tomb of the saint in Myra. 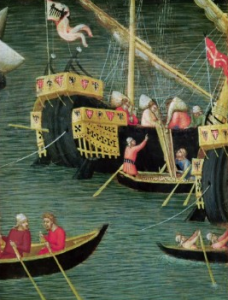 They were in competition with sailors from Venice who were trying to secure the relics of Saint Nicholas for their church dedicated to the saint on Lido Island. In the late 1950s a group of scientists was allowed to examine the relics of Saint Nicholas in the crypt in Bari and in 2005 a forensic report was sent to the lab in England which revealed that the saint was 5 feet tall and had a broken nose (probably, due to the torture Saint Nicholas suffered in prison during the persecution the church endured under emperor Diocletian). Saint Nicholas’s history was proven by modern day forensic science. Saint Nicholas Day on December 6 (December 19th in Orthodox Christian countries on the old calendar) is wildly celebrated as a joyous festival for children. The American Santa Claus, as well as the Anglo-Canadian and British Father Christmas, is derived in part from the Dutch Sinterklaas. 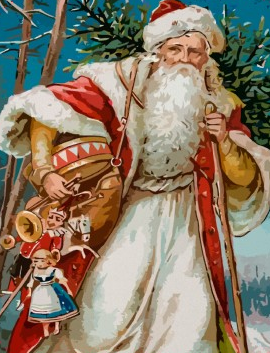 In Swiss folklore, the December gift-giver is known as Samichlaus (also modified pronunciation of St. Nicholas). In Germany, children leave a boot outside called Nikolaus-Stiefel (Nicholas boot) on the eve of December 6th. It gets filled overnight with sweets, but a naughty or mischievous child may find a rod instead. In Slovenia, Saint Nicholas’s visits to homes are accompanied by an angel and a devil. In Orthodox Christian countries Saint Nicholas day is celebrated during the Nativity fasting period (Advent) and the strict rules are slightly elevated to allow fish.. It is the time for a village-wide celebration where everyone contributes to the festive meal.